Labour Senators will introduce the party’s the Freedom of Information Bill in the Senate next Wednesday during Labour Party Private Members Time. Senator White said: “This Bill is designed to extend the scope of the Freedom of Information Act to a number of key bodies including the Garda Siochana and to repeal the regime of charges for access to information introduced by the Fianna Fail/PD government in 2003. “The Freedom of Information legislation enacted by the Rainbow government was grounded in the belief that public bodies must be accountable to the ordinary public they are there to serve and that accountability requires openness. Freedom of information overturns the presumption of official secrecy set out in the Official Secrets Act and replaces it with the legal presumption that the public has a right to know. Senator Hannigan said: “Freedom of information, everywhere it has been introduced, has brought about more open government and better administration of public services. Doing business in the open is the best guarantee of efficiency. “However, this government has always been hostile the concept of freedom of information and has done its best to undermine the original Act by introducing legislation in 2003 that severely restricted categories of information that could be applied for and by imposing a series of heavy charges designed to discourage people from using the Act. More :: View the Freedom of Information (Amendment) Bill 2008 by clicking here. We had the first of four planned information meetings on the Lisbon Treaty, on Thursday, April 24th at the Taney Parish Centre, Dundrum. All of these meetings are open to the public and we hope that people come along to inform themselves and debate the issues. Liz McManus T.D. and Blair Horan of the Civil and Public Services Union got the ball rolling on Thursday night. Liz pointed out that the core values of the Treaty are in alignment with the core values of the Labour Party emphasising as they do equality, democracy and social justice. The Treaty will make the European political process more transparent. It will also allow for a Citizenship Initiative, whereby European citizens can mobilise to put an issue of concern to them on the political agenda. Blair focused more on the role of the Lisbon treaty in fleshing the social and economic rights of European citizens. The Lisbon Treaty, he said, introduces for the first time the prospect that citizens can look to the European Union to vindicate social and economic rights. He said he was optimistic about the potential benefits of this for European workers into the future. A lively discussion ensued. Barry Desmond, former T.D. and M.E.P. expressed his concern about the changing political landscape in Europe, particularly the possibility of an emerging right-wing bloc lead by Silvio Berlusconi in Italy and Nicolas “Starkozy” in France, and potentially supported by euro-sceptics in Poland, and the U.K. Desmond said that Ireland and other European countries needed to remain vigilant as the EU has the potential to fragment politically. The meeting also discussed Ireland’s role within the EU peace keeping initiatives, the arguments being put forward by Libertas and the tardiness of the government in getting out and joining in the debate on the Lisbon Treaty. The next information meeting will take place at the Community Centre, Nutgrove Avenue, Rathfarnham on Tuesday, May 12th. I hope to see you there. Senator Alex White has expressed his frustration and disappointment with the lack of progress of extension plans for St Colmcille’s Junior School and Senior School in Knocklyon. Senator White was speaking in the Seanad yesterday where he highlighted the situation the staff and pupils now find themselves in. 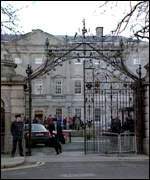 “The difficulty is that the schools wish to apply for planning permission but so far the Minister has not seen fit to permit the school to proceed with this application,” Senator White told the Seanad. “The schools have slightly fewer than 500 pupils in prefabricated accommodation with a total of 16 prefab classrooms and 14 prefab resource teacher rooms. Most of these prefabs were installed 20 to 25 years ago. “It is vital that this project proceeds,” he explained. The School is awaiting permission to apply for planning permission since last November. In response, Minister of State Máire Hoctor told Senator White that the school has “a significant amount of accommodation but still has a shortfall” and failed to set a date to allow the school to apply for planning permission. Senator Alex White said that describing the school’s accommodation problems as a ‘shortfall’ was “the greatest understatement I have heard for a long time” and was quick to point out to the Minister of State that allowing the school to apply for planning permission would not cost the Government a cent. “I do not understand why, in circumstances where costs are not entailed, the Minister could not see her way to giving the green light to the schools. The momentum exists in the schools and in the local community which provides fantastic support for the schools,” he said. More :: Read the full transcript of the debate here. Reports that the HSE is unable to respond adequately to hundreds of cases of vulnerable children because of staff shortages and under-resourcing is a further indication that our health services, and our child protection services in particular, are run on the basis of profit and loss accounts and balance sheets, rather than on the basis of the needs of vulnerable children. The book-keeping culture that prevails in the HSE has led to a situation where the protection afforded to children is largely confined to emergency action. Local child protection teams simply don’t have the resources they require to make early interventions, in order to prevent a problem in a family escalating into a crisis. Social work teams are hugely under-resourced, and thanks to the HSE staff recruitment embargo, just about every one of them is operating well below full staff complement. When you consider the massive backlogs in many areas of the country, the lack of an out-of-hours service, and the lack of specialist residential places for children with challenging behaviour, the scale of the problem is massive. In addition, it is unacceptable that the information which emerged today is three years old at this stage. Under the Child Care Act 1991, the HSE is obliged to report on their child care activities on an annual basis. There is little value to this requirement if the information they provide is not delivered in a timely basis, so that problems can be identified, addressed and resolved quickly. It is also extraordinary that the report referred to in today’s Irish Times appears to have been sent to the Minister by the HSE in late February, but is only coming to public attention today. While the report was placed on the HSE web-site some weeks ago, both the Minister and the HSE must ensure that there is immediate publication of such reports in the future, especially where their contents are already years out of date. The constituents of Dublin South and beyond will have an opportunity to discuss many of the issues surrounding the forthcoming referendum on the Lisbon Reform Treaty. Along with my colleague Liz McManus TD and Blair Horan, General Secretary of the Civil Public and Services Union (CPSU), I will be fielding questions on the Treaty and providing a forum for the general public to air their views on Thursday 24 April. The venue will be Taney Parish Centre, Dundrum and the event starts at 8.15 p.m. This event is a public meeting so everyone is welcome. I look forward to seeing you all then. More :: Find out more on the Lisbon Reform Treaty by clicking here. The report of the Independent Inquiry into how a lecturer in child care policy at the Athlone Institute of Technology was able to remain in his post two years after his conviction for serious sexual offences in Holland raises serious questions about the operation of child protection measures in this country. Parents will find it hard to understand how no action was taken despite the then Midlands Health Board and the Gardai being notified of it within days of its occurrence in Holland in June 2004. This was a serious incident involving violence and indecent acts. Surely we should have accepted by now that when it comes to the welfare and protection of children no avoidable risks should be taken. In this case it appears that proper procedures were followed and that the appropriate authorities were notified, but no action was taken but for reasons that were not entirely clear. We must now learn the lessons of this affair and ensure that not only are appropriate procedures in place, but that they are acted upon when incidents like this occur. The recommendations made by Mr. Devine in his report should now be placed for consideration before the Oireachtas Committee on the Constitutional Amendment on Children. On behalf of the Labour Party, I wish to be associated with the tributes to the former President, Dr. Paddy Hillery. His death represents the passing of another member of an extraordinary generation of politicians, namely, those who were born immediately after independence and who came to prominence in the middle part of the previous century. Members of that generation are characterised by a particular kind of commitment to public service. Different generations have various ways of expressing the commitment to which I refer. The type of commitment displayed by Dr. Hillery could be almost described as a form of sacrifice. This is a recurring theme with regard to Dr. Hillery. He said himself he felt he did many things out of a sense of duty. There was a sense of selflessness about it. It can absolutely be said of that generation, and particularly of him, that his commitment to politics and public service was motivated by nothing other than a sense of duty and of honour at serving one’s country. There was never any question of its being done for personal gain or opportunity. This is something that characterises that generation of politicians and public figures which, in a sense, is now passing. His passing is a particularly poignant example of that. As others have said, Paddy Hillery distinguished himself in a number of different positions in Government. In particular, as Minister for Education, he laid the groundwork for much of the work that was done later. He was essentially a progressive Minister for Education and did a large amount of work in that position. For a short time he was Minister for Industry and Commerce, but he was particularly important in his post at the Department of Labour, introducing industrial legislation in the late 1960s which is still an important part of our industrial relations infrastructure. Others have referred to Dr. Hillery’s work on Northern Ireland. I endorse the remarks of Senator Fitzgerald with regard to his contribution to the major issues of peace in this country and our involvement and commitments in Europe. I remember when he stood up to the Irish Government in respect of equal pay, which I welcomed. It was vitally important in those early years of our membership of the EEC that we did not see the benefits of our involvement as flowing in one direction but that we also made a commitment to a fundamental right to equal pay, which was then expressed in legislation in 1974. This was a vitally important, progressive move. He was clear that it had to be implemented and he did the country a great service in this regard. I join with my colleagues in conveying my sympathy and condolences to Paddy Hillery’s family, Dr. Maeve Hillery and Dr. John Hillery, and recall his great personal warmth as a human being as much as a politician. His loss will be felt greatly in this country. I wish to be associated with today’s tributes. We have not yet begun to get our heads around what is happening in terms of the economic situation. Last week, the greatest increase in unemployment since records began was reported. We have a veritable collapse in the domestic property market in this city according to anecdotal evidence and what has been written. This morning, I saw a “sale agreed” sign on the south-side of Dublin. It was a bit like the first cuckoo of spring but I am not sure whether it will be followed by many more cuckoos. The construction industry will be seriously impacted by this. According to comments made today by one commentator, David McWilliams, who is hardly a socialist firebrand, we have invested so much in property in recent years that we have exhausted the capital base in the country. We have a serious situation facing us. It is not an exaggeration to describe it as a crisis. Again and again in the Seanad I have heard the Leader and others reeling off the achievements of the Government. The Government has had achievements but if it is correct to state, as I anticipate the Leader and others might, that the economic downturn is largely the result of international forces, it is incorrect to state the Government was responsible for the boom. As I pointed out before, one cannot have it both ways. One cannot state the Government created the boom but has nothing to do with the issues we now face. In a compelling piece, David McWilliams also points out that at the heart of the job over which the new Taoiseach must preside is the stunning accumulation of wealth at the top of society. He recalls last year’s wealth of the nation report from Bank of Ireland. The top 1% in the country own 20% of the wealth. The top 5% own 40% of the wealth. Let us pause to consider the fact that 40% of the wealth of the country is owned by the top 5% of the population. This is one of the legacies of the boom and an issue with which we must wrestle as we consider future economic policy. It is not enough to state we improved social welfare in line with or above inflation. We must consider the opportunities we will present, spread, foster and offer to the young people, whether in Limerick or elsewhere, caught up in social problems and crime. Will the weaker in society suffer with a downturn in the economy? This must not be the case. We must examine this splurge of wealth at the top, whether it is symbolised in the Galway tent or elsewhere. We need to turn this around and ensure economic policies develop the country. Let us have all issues open, including this extraordinary inequality, which is one of the unfortunate legacies of the boom. Senator Alex White: As Senator Fitzgerald stated, it has been a busy time since we were last here. Last week in particular was very eventful. When I entered the Chamber today, I was prompted to look across, with mounting concern, to ensure the Leader was still sitting in the place with which we associate him. I am glad he is still there today. Senator Donie Cassidy: I am glad to see the Senator here also. An Cathaoirleach: The Senator should speak on the Order of Business, please. Senator Alex White: I noted the remarkable sense of relief that appeared on the Deputy Leader’s face after the events of last week. No doubt the developments came as a great relief to him and his party, or so we are led to believe. Senator O’Toole and others have made the point that it is a pity that the Taoiseach has not had the opportunity to speak in the Chamber during the term of this Seanad. Senator O’Toole’s suggestion might be a way of addressing this. The very significant achievements of the Taoiseach, Deputy Bertie Ahern, must be acknowledged without question, particularly in the context of the historic events in Northern Ireland. When the history of these events is written – some of it has been – many players will be regarded as having made a significant contribution. It can probably be said that few, if any, made a more significant contribution to promoting peace and ensuring a resolution to the Troubles than the Taoiseach. I have no difficulty whatsoever acknowledging that. We should also acknowledge that, in general, the Taoiseach has been an extremely successful politician. Somebody said to me that one of his characteristics is what is called the “likeability factor”. I agree with this but the Taoiseach has needed the likeability factor, particularly in the past year or two. I wonder whether he would have survived as long as he did had he not had it. It is a pity that the departure from public life and politics of somebody who achieved so much is tainted. There is no question about this. I will seek a debate on an issue related to the Taoiseach’s departure which Senator MacSharry raised before the break. It was a pity that the Taoiseach spoiled the dignity of the occasion last week – he was backed up in doing so – by again refusing to pass up the opportunity to have a go at the tribunals. An Cathaoirleach: I do not want any discussion on tribunals. Senator Alex White: —–in circumstances in which we need to purge all the anger felt, as expressed by Senator MacSharry on the last occasion on which he raised this matter. Perhaps we still need to purge this anger because, although the Taoiseach is going, the tribunals are not. We cannot have it both ways. We cannot have a parade of people asking that matters be left to the tribunal while the Taoiseach and a queue of Ministers never miss the opportunity to attack it, particularly on an occasion such as that last week. Senator Fidelma Healy Eames: Hear, hear. Senator Alex White: Either one approach or the other should be adopted. Either the tribunals are to be maintained and supported by this House, which set them up through the motion proposed by Senator Cassidy ten years ago, or they are not. Remarks such as “low-life stuff” are not worthy of a Taoiseach, be it a departing Taoiseach or a sitting one. An Cathaoirleach: I am allowing a certain amount of latitude but we cannot discuss the tribunals. Senator Alex White: In such circumstances, I ask that we have the debate Senator MacSharry called for before Easter. I hope he has not withdrawn his call therefor. Perhaps we can have the debate in calmer circumstances given that Deputy Bertie Ahern is to some extent out of the equation, at least as Taoiseach. Let us determine how much the Members opposite really support a tribunal investigating the matters that occurred so recently in our public life. The President of the European Parliament, Mr. Hans-Gert Pottering addressed the Seanad this morning on his trip to Dublin. During his speech, Mr. Pottering praised the valuable work of Irishmen and Irishwomen in Europe, their contribution to the workings of the Union and the value of the Lisbon Reform Treaty. “I trust in the wisdom of the Irish electorate, which perhaps is the best-informed electorate in the EU about European matters,” he said. I am delighted on behalf of the Labour Party to welcome the President to the House. We are affiliated to the socialist group in the European Parliament, which vies with the President’s group for largest group.We do not have the largest group currently but we hope to before too long. I had the pleasure of meeting the President last night and he said something to me that very much resonated in the context in which we are speaking. The President stated that being in Berlin in 1962 or 1963 and seeing the wall being constructed represented the single biggest motivating factor for his entry into politics. All of us, whether left, right, centre, red, green or blue, celebrated the removal of this abomination at the heart of our continent. It was extraordinary to see the division it constituted in the continent of Europe removed so quickly in the end. It was also an enormous moment historically for Europe to see it go. It seems that in the context in which we are discussing the Lisbon treaty and having this debate we should not forget that this was an enormous symbolic occasion for Europe and the importance of a united Europe. Unity in Europe cannot be founded only on symbols, important as they are. My party will support the Lisbon treaty enthusiastically and will actively canvass and campaign throughout the country for a “yes” vote. This morning’s discussion is an interesting and useful occasion. However, while it is not so much that storm clouds are gathering, in any debate we must address the serious economic issues we have on a worldwide scale at present. We have seen what happened in the United States and Europe. What serious role can the European Union take to address the concerns of many millions of workers throughout the Union that at a time of economic downturn, the first to suffer are those on low pay and low wages? These are people already affected by the impact of the various inequalities which still have not been removed throughout the continent. We still have a 15% gender gap in pay, despite all we achieved. We still have a gap between rich and poor in all countries of Europe and between the security of employment many of us have and the precarious situation many workers face. An issue I am especially concerned about is the question of the draft directive on agency workers, which we have debated in this House. I am sorry to state the Government has not seen fit to support it, at least at this stage. Does the President agree with me that it is vital a measure such as this is brought forward quickly? If it is not brought forward during this Presidency, it should be brought forward in the next. People who quite rightly are asked to vote in support of the Lisbon treaty would see they have a stake in it and that it has a real impact on their lives. Something which often amuses me, and I saw it arise again in recent days, is the notion of red tape. I would like to reflect on this idea. People rail against red tape and no one likes unnecessary bureaucracy. When we criticise red tape we forget that in many cases this so-called “red tape” represents a major achievement. People speak about the burden of regulation. I would like to speak more about the achievements of regulation such as the fixed-term work directive and basic minimum holidays and hours of work which came from European directives. We also have the equality directives, including the new equality framework directive. All of these were initiated in the Commission, debated and passed at European level. I do not regard any of these issues as red tape or a burden. I regard them as real achievements for workers throughout Europe. It is unfortunate that during the debate in the European Parliament in recent days, it was suggested by some Members that the new framework directive brought forward by the Commission, of which I am sure the President is aware, represents more red tape. If what is needed to combat income, gender and race discrimination is called red tape then I embrace red tape. If this is what it is let us have more of it. Of course, this is not what it is. It is a pejorative way of describing it. It is a real achievement of Europe and if the workers of Ireland are to be asked to support the Lisbon treaty, and we will ask them to do so, they must see that ratifying the treaty will have a real impact on their lives. In response to my concerns, Mr. Pottering stated that the EU needed to find a “middle ground” in relation to red tape.